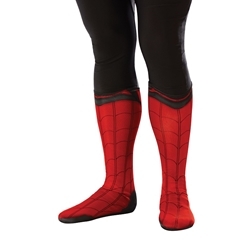 The Adult Spider-Man Boot Tops include one pair of officially licensed red Boot Tops as pictured. These boot tops are available in Adult’s One Size Fits Most. Slip out of your secret identity and into your Superhero Costume with the Adult Spider-Man Boot Tops! Pair with our Spider-Man Deluxe Adult Costume and Spider-Man Adult Gloves for a completely immersive superhero costume this Halloween.